The countdown clock in the corner of his room is a constant reminder of the deadlines he has to hit. Technical director Mike Rigg has his eyes on three dates - May 12 - the end of the season; July 1 - the rough start of pre-season; and August 8 - transfer deadline day. Burnley are playing catch-up in their attempts to improve their results in the transfer market. But Rigg is implementing a process at Barnfield that he hopes will take the club's recruitment department to the next level, deadline by deadline, window by window. Nowadays, supporters and reporters can access masses of facts and figures on the performance of players, with websites such as WhoScored, Transfermarkt and Squawka. The metrics available to the man in the street are pretty basic, however, compared to paid-for, data available to clubs. And Burnley have given Rigg the resources to help identify more players in more leagues in more countries, to give the club a better chance of building on the success Sean Dyche has enjoyed since his arrival in November 2012. Premier League clubs are following the lead of American sports and investing in analytics for the long-term. Rigg is at pains to explain that Burnley aren't going down the Moneyball route - brought to everyone's attention by the 2003 book and subsequent Oscar-nominated film starring Brad Pitt - as stats won't necessarily overrule what scouts see with their own eyes. But the data is a vitally-important tool to spread the net wider than ever before at the club. Rigg said: "We're definitely catching up. You could ask why has the club needed to, because it's been incredibly successful, on tight budgets, but we are doing this because of the foresight of Sean and Mike Garlick. "They've sat down and looked at how they reinvent it to move on another level. "They've signed this off, this is a professor we work with, where we use various analytics. "There are lots of companies, InStat, Opta, that collect information from every player, from every action, from every game, all over the world. There's a lot of raw data we use. "We've invested in this, and we've got all this information updated every week on players. "Analytics is the first stage of a simple filter. There are a series of measurements, how the players play, ‘plus minus’ invented 20-30 years ago for basketball and ice hockey, the effect players have on the team. "The two interesting ones are how he is performing, and what his potential is. "What we want to try and do is not buy a player for what he's done, but for what they've got the potential to do. "We won't sign a player on this, but it will help us look at players, see something interesting and investigate further." Rigg took some convincing of the importance of data, but is combining a modern approach with old school scouting: “I was very sceptical about data. But data is not going away. What we are trying to do is to use more resources. It is never going to do away with the traditional stuff. What we are doing is using the data to try and help us filter. “We are just now in the process of appointing a team of technical analysts who will help interpret this, and at that point we have our normal scouts who will go out. So it is part of the filtering process. The work that goes into this is a bit of our intellectual property which we pay for, and which we don't want to share with other clubs, and I think we have got something which is better than anything out there. “Liverpool do this massively, Barcelona do this massively. “This is using some of the science and some of our numbers and we will use our eyes. We will be watching thousands of games a month to watch players on video where we can stop, pause, rewind and clip before we go out and watch them. “That is obviously very labour intensive. We have got three deadlines, May 12 which is the end of the season when we want to sit down and between me and the manager make sure we have got a good handle on things. You have got July 1 because that is roughly around the start of pre-season so if we can do our business between May and July and give the manager as much time to work on his squad then great, but unfortunately a lot of that is out of our hands because the third deadline is the transfer window, August 8. “If we do all this work but the selling club goes 'we'll keep this until August 7 because I am going to bargain and try and get as much out of this as I can' then we can't control that, or we can by paying three times over the odds. “It is making sure that the business and the football plan comes together. The data will be used for a more tailored approach, to help target the specific type of player who would be, on paper, a good fit for what Dyche demands of his squad: "What I've got to do, and this is key, is understand the Burnley metrics. "I've got to see what Sean wants, what are the standards and what he's looking for, and try and use as many different resources as we can, to layer them on top of each other, to help make a decision. "We measure every single training session and game here, physically, distance run, sprints, speeds. "We have to try and use the same metrics to measure players we're looking at. "But we are hoping to bring in better players than we have - easier said than done when it comes down to finance. "So you're looking at leagues, England, Scotland - that is 1,500 players, fairly small. "So the manager has been saying he wants to increase the pool. Going back to Brentford and buying the next James Tarkowski is a lot more difficult now than three years ago. Mepham goes for £12m, so say we're looking at 25 leagues, Germany, France, Spain, Italy, Belgium, Holland, or more if we go into South, North America. "Then there are various restrictions, you can't always bring in a player from South America, Brexit will have an impact, there are a few unknowns. "But we don't want to spend a shedload bringing a 16-year-old in from Brazil when we're not looking what's under our nose in the villages and towns, or the next Dwight McNeil, released from United or City." And the sheer scale of what Rigg intends is staggering. He wants 10 options for each position across four key groups within the club’s playing staff - a total of 440 players. The players are split into Development, Breakthrough - both roughly ages 16-21, Peak - 22-30, and Twilight - 30-plus. Rigg explained: "We have all the facility and resources here to get the best out of what we have, and the manager is fantastic at using what we've got and getting results, but we have to constantly think of the what ifs? "What if something happens to one of our players, what if someone gives us £100 for one of our players? We have to constantly reinvent the squad, with players running out of contract, or maybe a player wants to move on. "So it's about having a process, not relying on agents lobbing names in. "The club has invested in doing it all better - all of the time. “We're all in the same building, everyone is on the same page, and we're trying to create a 440 list of targets. We group the squad into four sections, Development, Breakthrough, Peak and Twilight. That reinvention - as Fulham have found to their literal cost - can be too much, too soon, and Rigg added: "The general idea is we have a group of players, players coming through the academy, contracted first team players, and what we're constantly trying to do is reinvent that - every club more or less has the same vision, Premier League success, and a trading profit. “Our plan is to avoid becoming financially unstable, but stay in the Premier League. And we don't want to make a shed load of money, and get relegated. "So we have to aim to be in the Premier League year after year and aim to be financially self-sufficient. "That's a really contentious issue with some football fans, who want you to spend the money, but my job is to try and make sure we achieve both the best way I can. "I think, as a club, we don't want to look back having spent a load of money, but finding ourselves in League 1. "So we have two plans, the football plan, and the business plan, and the key is how we get both working together. "It's common sense, but how do we achieve that? A big part is to go to Category 1 with the Academy, we have this unbelievable facility, the club's made an incredible investment, in staff as well. "We want to be one of the best Academies in the country, but we can't spend what Manchester City spend, so we've got to do what's right for us. 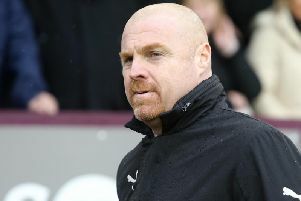 Rigg is also aware of eroding the culture and environment Dyche has built up in over six years at the helm: "When people say 'just sign this player or that player', it's harder than it looks. "We sell all our players and make £500m, then bring in players from France, Germany, Italy, Spain, Holland and it affects the DNA of the club, because we don't want to spend £125m and get relegated - it doesn't always work. "What Sean has done for the last six and a half years is create a culture and environment on the lowest wages, in the hardest league, with a group that has kept us in the Premier League. "No other club in the country has done that, done what he's done. So it's a pretty tough act to keep on reinventing this year after year.